If you all had £1 for the amount of times I’ve mentioned my holiday coming up, you’d all be reading this on holiday from a yacht en route to the Maldives. Well, today I wanted to drop the ol’ holiday line into the equation again as I talk about one of my in flight essential products; face wipes. Now I know that face wipes often get a bit of stick but for holidays, festivals and events where you need to pack lightly, they’re an absolute godsend. That is especially the case when you find some really good cleansing ones as they can replace your other makeup removal and face cleaning products for a short while. 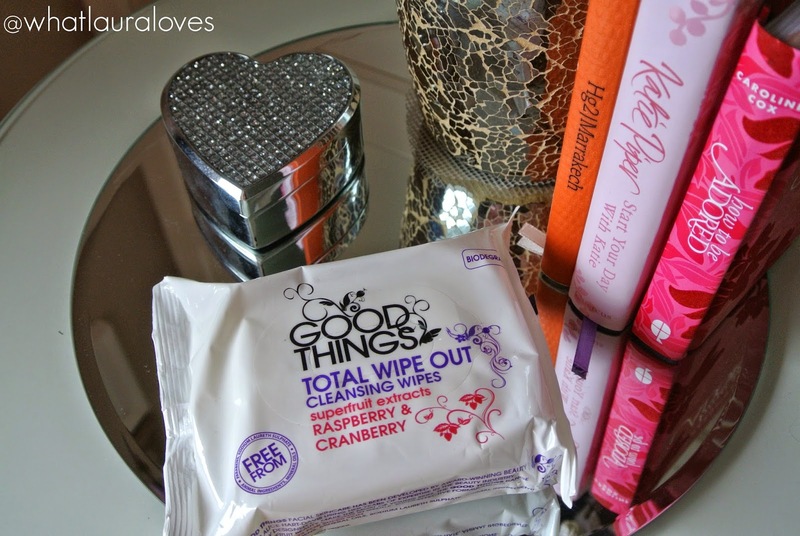 The Total Wipe Out Cleansing Wipes from Good Things are one such product. Good Things are a gentle skincare brand that I have loved for YEARS. They make some of the best, most affordable skincare products out there and I would especially recommend them for young skin because they’re not full of nasties and are very soothing and gentle on the skin. These wipes do not contain parabens, sodium laureth sulphates, mineral oils and animal-tested ingredients. They’re also biodegradable. They’re very easy to use, simply peel back the label and pull out one of the wipes. They feel soft and moisturising to the touch and not sticky in the slightest. I like to wipe them over my whole face in circular motions and down onto my neck. When it comes to my eyes, I fold the wipe up a little, hold it over my eyes for a few seconds and then wipe away my eye makeup. These wipes are very moist, more so than other cleansing wipes that I’ve used which means that they’re able to do a better job at removing makeup than others. The Total Wipe Out Cleansing Wipes are definitely a staple for me when I travel, particularly on planes. I like to pop them in my hand luggage bag to use to remove my makeup when I get onto the plane. I only wear a light makeup look when I’m travelling but I do like to take it off to let me skin breathe and so that I can add some extra moisture to it during the flight. The air con on aeroplanes has a bad habit of drying out my skin so applying some moisturiser and lip balm mid flight is an essential part of my routine. 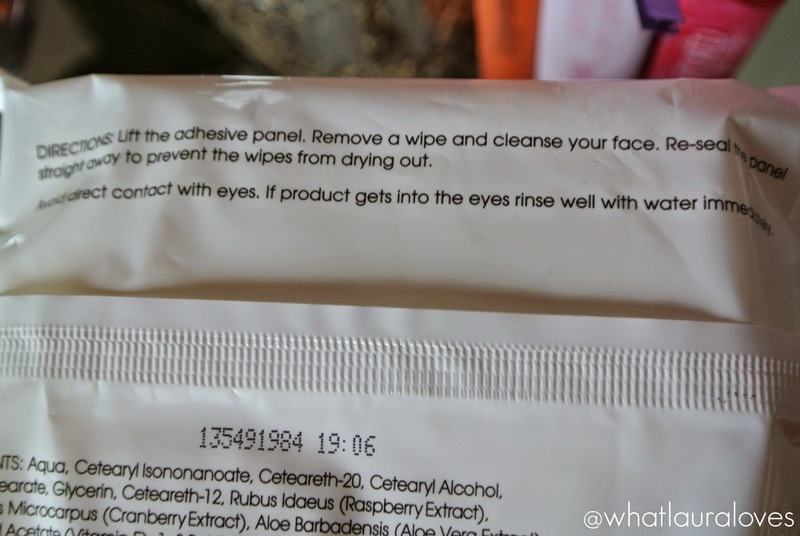 On long haul flights, I often apply a clear, highly moisturising face mask and these wipes are great at removing that without having to go to use the sink in the bathroom. These wipes remove all but the most deep set of makeup so when I’m wearing a very heavy base, they are a great first step in my skin care routine. They remove the thick of my makeup and then I follow up with a second cleanse to thoroughly cleanse my skin. When I am wearing a very light base, such as when I fly, or when I’m not wearing makeup at all, these wipes are very good at cleaning my skin and refreshing it. They remove dirt and impurities and leave the skin feeling clean but nourished. The wipes have lots of beauty boosting ingredients within their formula such as raspberry and cranberry extract that help to sooth the complexion which is ideal if your skin is irritated or sensitive. They also contain aloe vera which is great at helping to reduce redness, even in the most sensitive of skin, and vitamin E which is great for moisturising the skin. The Good Things Total Wipe Out Cleansing Wipes come in a pack of 25 which means that you’ll have plenty for a trip abroad or for a weekend camping while watching your favourite bands thrash it out on stage. Not only are they great for cleansing the skin but they’re also great at refreshing your hands and under arms too. If I’ve been sitting on a plane for hours then I like to arrive at my destination feeling clean and fresh and these wipes certainly help to achieve that! They’re available to buy from Boots where you’ll often find them on a 3 for 2 offer and from Sainsburys stores. You can find out more about the Good Things brand on their website.